Powers/Abilities: Chaos possesses the metamutant ability to absorb ambient stellar energy and re-emit it as a focused plasma blast. He can also use the energy to fly and erect personal force fields. Joshua's powers manifested themselves at a very early age, however, and remain raw and unstable. Chaos often looses control of his powers (especially during times of stress), finding himself unable to keep his energy from discharging or unable to alter the trajectory of his flight. Chaos' temperament is equally unstable. (JLX Unleashed!#1(bts)) - Joshua Summers lived in an orphanage with his brother, Ray. But Joshua's metamutant powers, unlike his brother's, manifested themselves at a very early age. Unable to control his newfound powers, young Joshua destroyed the orphanage and nearly everyone in it. 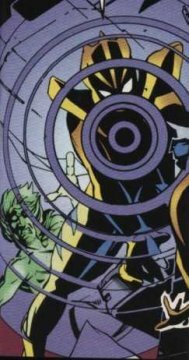 Mr. X, who would form the JLX nearly a decade later, was monitoring the activity of the Summers brothers (who he apparently knew were both metamutants, although Ray's powers had not manifested yet.) In his guise of Marco Xavier, Mr. X removed both Joshua and Ray from the orphanage. While Mr. X transferred Ray to a school where he was adopted by human parents, he decided that it was in Joshua's best interests to be held in stasis at AIM-STAR Labs for the time being. Suspended in cryonic fluid and contained within a reverse ionic polarity field, Joshua remained in stasis for nearly a decade. During that time, Mr. X remained on his mind every moment as Joshua learned to enjoy hating his mysterious benefactor. (JLX Unleashed!#1) - "The Inextinguishable Flame!" - Nearly a decade after Joshua was first placed in cryonic stasis, the demon known as Fin Fang Flame attacked the cities of the world. Wonder Woman broke Mr. X and the JLX (including Apollo, Ray's brother, who was trapped in a catatonic state at the time) out of prison so that they could help defeat the rampaging demon. But before the JLX confronted Fin Fang Flame. Mr. X took a side trip to AIM-STAR Labs in order to recruit Joshua's help for the upcoming battle against Fin Fang Flame. Once taken out of stasis, Joshua Summers was angered at the very sight of Mr. X. Joshua revealed that he had hated Mr. X ever since the day he showed up at the orphanage and took Ray away. Accusing Mr. X of hypocrisy, Joshua claimed there was no difference between what Mr. X did to him and what the humans did to the JLX. Although Joshua at first threatened to kill Mr. X, he was eventually convinced to help the JLX in their mission against Fin Fang Flame. Later, aboard the JLX Wavecruiser with the rest of the team, Joshua (now calling himself Chaos) ridiculed the JLX's plan of action and reiterated that he was not a member of the team -- he simply does as he pleases. Wonder Woman warned Chaos that his powers were unstable and that he should not overexert himself, but Chaos paid her no attention. Chaos engaged Fin Fang Flame along with the other members of the JLX. But when Mr. X ordered him to disengage and fall-back so the team could regroup, Chaos was unable to break his trajectory because his G-Forces were too strong. After colliding with Fin Fang Flame, Chaos found himself trapped in the massive demon's body, with only his personal shields to protect him. Chaos remained trapped within Fin Fang Flame until Apollo finally snapped out of his catatonic state and used his metamutant ability to absorb solar radiation to draw the power right out of the demon. With the demon defeated, Apollo (now mutated even further into an energy being by the massive amounts of energy he absorbed from Fin Fang Flame) flew off alongside the victorious JLX carrying his unconscious brother in his arms. It remains unclear whether Chaos is older or younger than his brother, Apollo. Although, as of JLX UNLEASHED!#1, Apollo certainly appears to be older than Chaos (who still looks like an adolescent), it could be that Chaos' aging process (both physically and psychologically) was suspended during the time he was placed in stasis at AIM-STAR Labs. 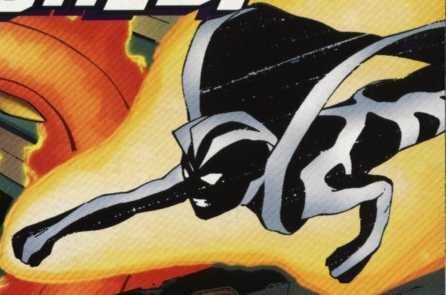 In the Marvel Universe, Havok (Alex Summers) is the younger brother of Cyclops (Scott Summers); while in the DC Universe, Spitfire (Joshua Terrill) is the older half-brother of The Ray (Ray Terrill) -- so that doesn't shed any light on the subject.  Spitfire of the mainstream DC Universe, Joshua Terrill, @ The Ray (vol. II) #17??  A.I.M. (Advanced Idea Mechanics) of Earth-616, @ ???  STAR Labs of the mainstream DC Universe, @ ?? ?